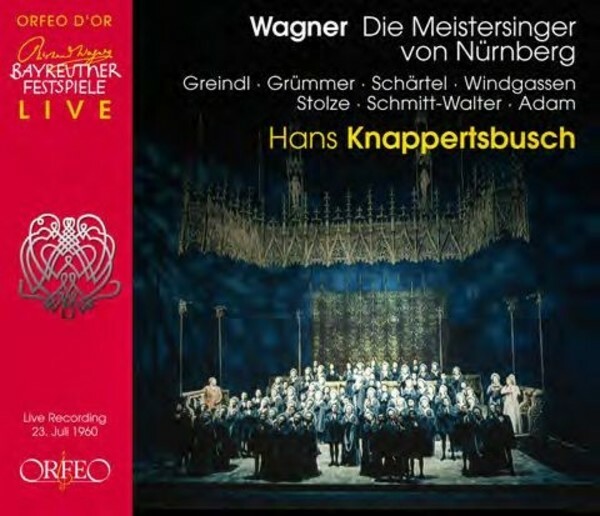 Hans Knappertsbusch's 1960 Meistersinger from the Bayreuth Festival benefits from a sense of vocal collaboration that is untypical of Wagner performances. Here, a highly colourful ensemble offers the vital variety necessary for its characters, and this is a happy mixture of proven older voices, younger voices that are just getting established, and an impressive debut in the role of Sachs by the 47-year-old Josef Greindl. However, the star of the performance is undoubtedly the 72-year-old newcomer to the production, Hans Knappertsbusch. His interpretation of this complex, tricky work is anything but Teutonic and heavy, but instead consciously cultivated and restrained, always supportive of the voices, relaxed, and with a chamber-music lightness in the dialogues (good in this work and precludes any sense of longueurs!). The impact of the fugue during the brawl in the second act, for example, is all the greater performed as a great arch (and with a great sense of fun in the hubbub it makes), and the excitement lasts all the way to the end of the act. The manner in which Knappertsbusch savours the dances on the festive meadow is also astonishing, displaying something between the magically twee and the gruffly rustic, all in careful doses, and conjoined with audible pleasure - this is truly 'festive'! In contrast to a market blighted by pirated and unauthorised editions, much care has been invested here in restoring the original sound. The booklet is adorned by exclusive stills from the Bayreuth archives and a highly stimulating essay by Peter Emmerich on the dramaturgical situation in Bayreuth in 1960 and its impact on the Festival audiences.